Most Hindu festivals are centered around two things: religion and food (usually but not always in that order). When we are not praying or singing, we are eating and talking, often very, very loudly. Sankranthi is no exception. Known by different names but celebrated all over the country, it signifies not only the harvest but the end of the inauspicious December/January season. Every region does its festivals a little differently, which I think is one of the best things about Hindu festivals. In Tamil Nadu the occasion is known as Pongal and rice is slow-cooked with jaggery and coconut to make a decadent sweet pudding-like dish. In the west and the north of India, sweets are exchanged to signify goodwill towards others. 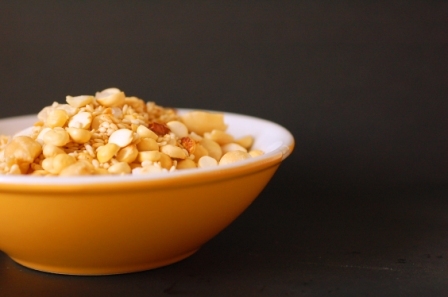 When it comes to Sankranthi, we Kannadigas (people of Karnataka state) traditionally make a slightly sweet, nutty mixture called Ellu. As a representative of the harvest being celebrated, we put together sesame seeds, peanuts, semi-dried coconut, tiny dried chick peas and jaggery. We then distribute small packets of this along with fruits to our family, friends and neighbours, our way of ‘sharing our harvest’. Every year, I look forward to this distribution as every household’s Ellu is unique with its’ own little quirks. But when I’ve picked out and eaten all the jaggery and coconut bits, leaving behind only the sad looking sesame seeds and peanuts, I am often at a loss as to what to do with these wonderful ingredients. 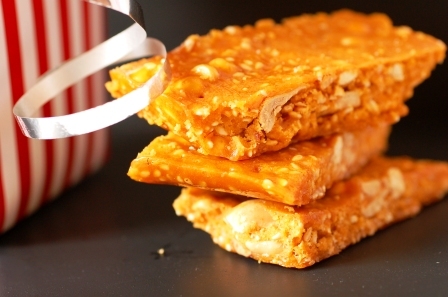 This year, I became obsessed with the idea of making nut brittle, or chikki as us Indians call it. More specifically, I wanted to replicate the buttery, dissolve-in-the-mouth peanut brittle that I have previously eaten in a restaurant. My first port of call was Deb Perelman’s incredible blog, Smitten Kitchen and it did not disappoint. I learnt soon after discovering this blog that Deb’s recipe collection is extensive and more importantly, fail (and fool) proof. This brittle was all I’d hoped for and more. If you are into this salted caramel business that seems to be taking over the world (and why shouldn’t it?? What could be better than the world being enveloped in caramel? ), this one is definitely for you. Not only will it make you and those you share it with very happy, but it will allow you to fund your dentist’s next three holidays which will make him or her very happy. 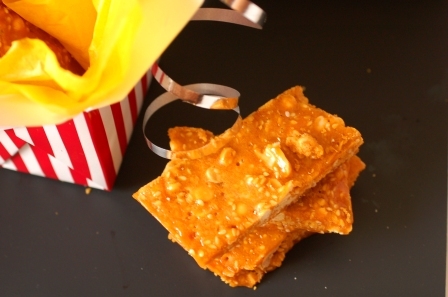 Sweet, a little nutty and just when you think you know what to expect you get a confusing hit of salt, this nut brittle is me all over! Preheat the oven to 150 C. Spread the Ellu or nuts out on a baking tray and roast for 8-10 mins, tossing halfway through until the nuts have browned slightly. Leave aside to cool. Line another baking tray with grease-proof paper. Put water, sugar, golden syrup and butter in a large non-stick saucepan. Stir to combine well and heat gently until butter is melted. With the heat on medium-high to high, cook while providing your undivided attention and stirring frequently. You will need to play around with the heat as the mixture will foam up constantly. After 15-20 mins when the mixture is a medium-golden colour, lifting off the sides of the pan and thickened to a consistency slightly thinner than honey, take the pan off the heat and add the baking soda. Foam-age will happen again so be careful! Whisk through and then add the salt and whisk again. Stir in the roasted Ellu or nuts. Pour the mixture into the lined baking tray and leave to set. You can either use a sharp knife to cut the brittle into pieces while it is still semi-soft, or wait till it is set, then shatter it into pieces. I used a 34cm x 23cm shallow baking tray and ended up with a thick (8-10 mm) brittle. You can spread it more thinly if you prefer. You can of course use just about any nut, pepitas, sunflower seeds or sesame seeds on their own. I will try this.Puttanna likes chikki a lot ! 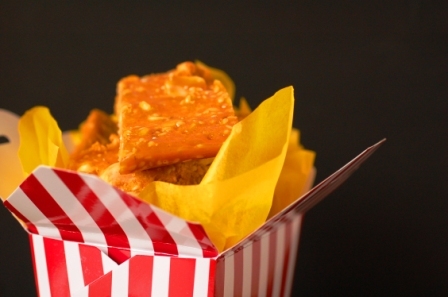 i was privileged to receive some of this delicious brittle. It had a fantastic texture and was crunchy without breaking your teeth. My only change to this recipe would be to make the salt even more subtle (1/2 tsp) as it was a little strong for my liking but i wouldn’t change anything else.